Turkey is currently the world’s 18th largest economy, with the potential to reach 12th place by 2050. 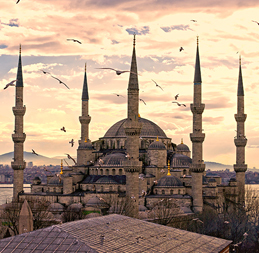 Though only 5 per cent of Turkey is in Europe, the country is considered Europe’s sixth largest economy and one of the fastest-growing markets in both Europe and the OECD. Turkey is under negotiations to join the EU. Almost 300 Irish companies currently have operations in Turkey and in 2013, Turkey and Ireland signed a Memorandum of Understanding to grow bilateral trade to €3.5 billion by 2023. For an estimate of landed costs (duties, taxes and other import fees) for shipments going to Turkey use the free and interactive DHL Express Trade Automation Services (TAS) tool, tas.dhl.com. TAS also provides information on regulations compliance and trade documentation. Ensure the actual value, weight and description of the shipment is clearly stated on all shipment paperwork (Waybill, invoice, ATR, EUR1 certificate, etc.) with no discrepancies in data. Write ‘Free of charge’ on invoices for non-commercial shipments. Formal exports are subject to Customs administrative fee, export bonded warehouse fee and brokerage fee. Formal imports are subject to additional Special Clearance Service charges (bonded warehouse fee, brokerage fee, transit under-bond fee, multi-line entry, document handling, proof of clearance, etc.). Used, renovated, old model goods: in addition to item restrictions, special import permit from Under-secretary of Turkish Foreign Trade is required (spare parts and cards are not allowed). Do not send to private individuals. Obtain permission from Turkey’s Monopoly. Importer/receiver to provide approval letter from the authorised museum in Turkey. Max quantity: 100 pieces per shipment. Max quantity: 10 pieces per shipment. (advertising and non-advertising), airline tickets, business cards, cheques. Max quantity: 500 pieces per shipment. Max quantity: 50 pieces per shipment. Provide authorisation from Turkey’s Ministry of Agriculture. Provide Sanitary Certificate from origin. Receiver must provide local approval from Ministry of Health and obtain permit from Ministry of Agriculture. Foodstuffs sent to private individuals must be recognised for personal use by Turkey Customs. Cosmetics and dietary supplements cannot be sent to private individuals. Items will generally need to bear the CE mark. If the origin country is an EU member: provide ATR; if not: provide Declaration of Conformity to CE. Computer components and parts: Provide maintenance certificate. Measuring apparatus and medical/dental supplies & equipment: provide EMC test reports and manuals. Medical apparatus: receiver to provide local Measurement Institute Report. Telecommunications equipment: Provide maintenance certificate and permit from Turkey’s Ministry of Communications. Toys provide permission from Turkey’s Under-Secretariat of Foreign Trade. List software value separately on invoice. Turkey Customs may require copyright approval. If value exceeds €75: formal clearance required. Send invoice with shipment. If sent as documents (up to 30 kg per piece and 150 kg per shipment), the receiver mission can complete formal clearance using a ‘courier letter’. For personal use: provide prescription and health report from government hospital. For commercial quantities: sender and receiver to provide Sanitary Certificate. Only models produced in current year can be cleared; used/renovated/old model items require special permission from the importer’s Ministry of Industry. Glass kitchenware: receiver must provide approval from Turkey’s Ministry of Health and permission from Turkey’s Standards Institute. Goods >100 kg can only be cleared by dedicated Customs administration. Receiver to provide authorisation from Turkey’s Ministry of Health and Ministry of Agriculture. Temporary import permitted; licence agreement required. Subject to formal clearance. Obtain authorisation from General Command of Mapping Turkey. Send as document. Enclose a packing slip with full details of each passport. If origin country is an EU member: include ATR certificate. If origin country is an EFTA member: include EUR 1 certificate. Other origin countries: include Certificate of Origin. Provide Quota Certificate for textiles sent from specific countries. Yarns/fabrics/ribbons: provide invoice with dimensions, quantity, components as percentages, component types. Some articles are subject to temporary import (labels, zippers, etc.). Contact DHL Customer Services for further information. For ivory, leather goods, seeds, personal effects, used mobile phones and x-ray machines please contact DHL Customs Services before shipping.